A couple of weeks ago, we visited The (Infamous) Breakfast club near Spittlefields market. Of course we were seated in about 30seconds because it was a Friday night at 10pm. As we tucked into our respective dishes, we began to get a bit philosophical about the culinary sweet spot between sweet and salty – bacon and pancakes, sweet and salty popcorn, honey roasted ham – all winners. But how can you introduce the same element of sweet and salty into a pancake dish without making it meaty? Of course, we thought suddenly, peanut butter. You’ll know from our previous posts that we are no strangers to using peanut butter in the kitchen. This recipe, a humble adaption of this one from Cookie and Kate, uses it in it’s most simple form – straight out of the jar and onto your plate. In a mixing bowl add the margarine, oil, bananas, lemon juice and maple syrup. Mash the mixture with a fork until the bananas are completely broken down. Crack the eggs into the bowl and beat them with the fork. In a separate bowl, use a hand blender to break the oats down into a flour. Mix in the salt, nutmeg, cinnamon, and bicarbonate of soda. Create a well in the flour and add in the wet ingredients from the other bowl. Stir with a wooden spoon just until everything is wet. Leave the batter aside for 10 minutes (longer will do no harm). Heat a large, non-stick frying pan and grease with butter/oil/calorie spray. When the pan is hot enough (if a splash of water sizzles) add a splash of milk to the pancake batter and use a 1/4 cup of batter per pancake. Cook each pancake for no more than 3 minutes on the first side, flip and cook over for another 90 seconds. Keep the cooked pancakes warm in the oven. 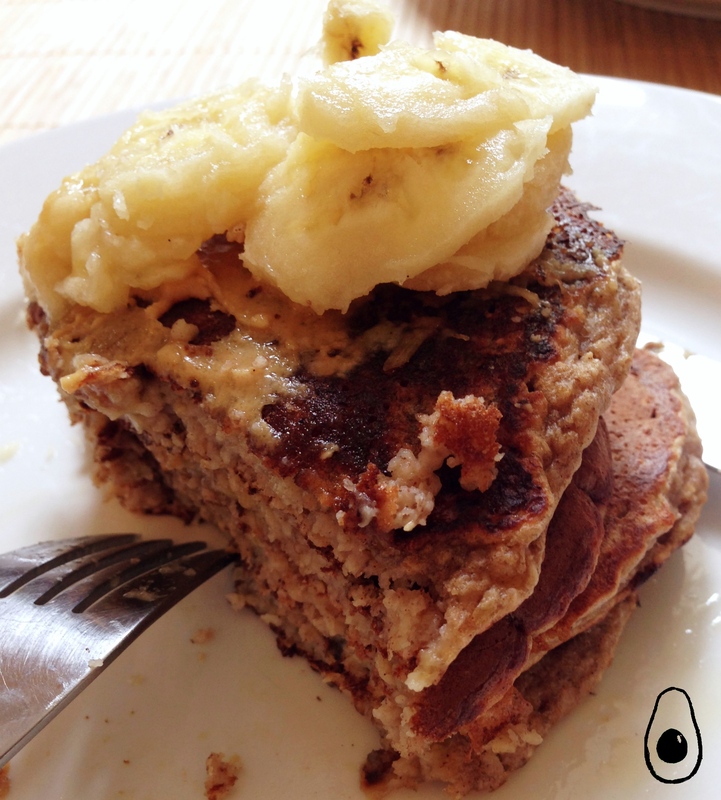 Assemble the pancakes in a stack, with a thin layer of peanut butter between each cake. Top with some sliced banana and maple syrup. 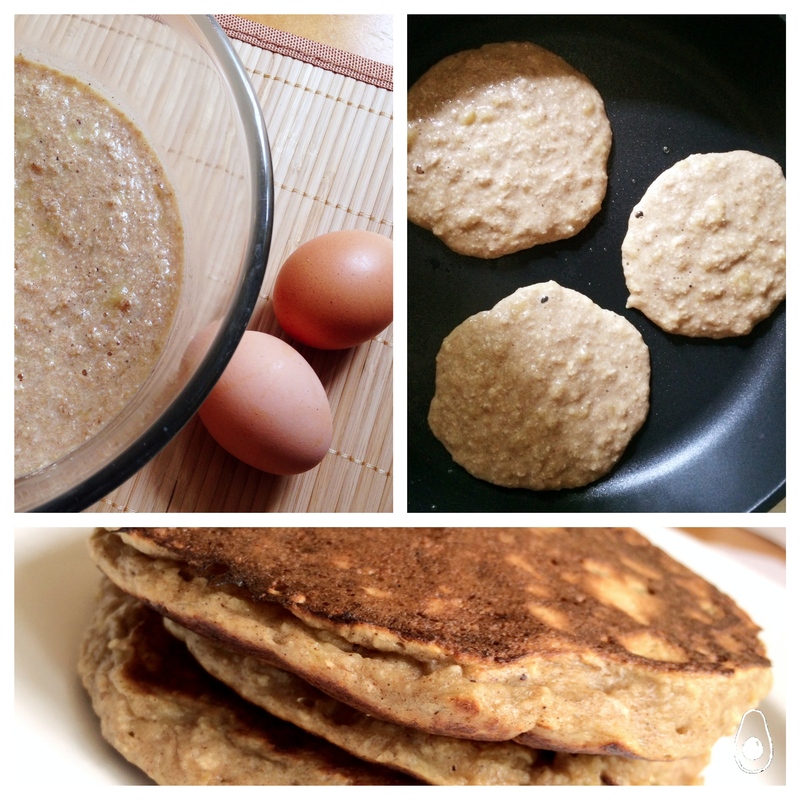 I love peanut butter and the pan cakes looks fantastic, soon gonna try them…. Very good! i just learnt tonite about dry frying sunflower seeds adding soy sauce and leavig to cool.. then crushing.. supposed to be just like bacon? yet i have to admit your post has got me sold on trying that brunch next time i visit.. Seeds that taste like bacon? I’m in. Yes, definitely do!! This is a great variation of the old favourite peanut butter and banana. Thanks for some the inspiration. It was a real hit in the house! 🙂 thank you! Omg! I was so proud of my pancakes made with buttermilk… but compare to yours mine were nothing! I’m sure they taste divine! Thanks a lot for being at FF! I bet yours tasted great 🙂 Thanks for stopping by!! I didn’t know the breakfast club is still open at 10 pm! It must be the only time of the day you can skip the queue 🙂 I’m all about pancakes lately… this is just right up my alley! Banana , Maple Syrup and Peanut butter, trifecta of yumminess!! !